Originally I meant to wax poetic about the rich red 1″ Grid. 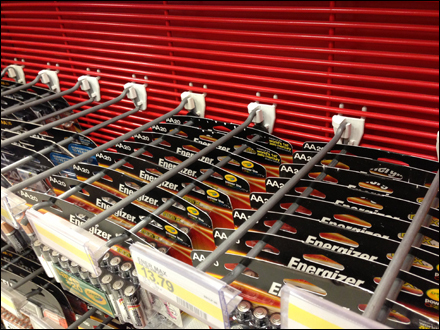 But use of Straight-Entry Scan Hooks in this Point-of-Purchase display was worthy of note too. Finally upon close inspection see that these oversize-bulk-pack batteries are twin hooked. But the dual hooks are more to keep the display looking as it should for a premium battery offering. The bulk packs would accept a single hook, but the display would surely look more disheveled in minuets … lowering the visual-value and price-attractiveness of the offering. There is a lot more going on in this display and its psychology that might initially be guessed. CLICK through the gallery below for alternate images. “Red Fixtures Tag” for a scrollable list of discussions.